We've told you this in the past, but it's worth repeating: when Hudson says "she thought they said 'illegal alien' and signed up," it's a joke about the actress's audition; it had been so long since the original movie came out that she didn't realize they were making a sequel, and really did show up in high heels and tons of makeup. Long recognized for her absolute dedication to the Corps, PFC Vasquez enlisted to avoid detention time in 2172 as part of the Service of [sic] Jail Act. While cited several times early in her career for disorderly conduct, Vasquez earned a silver National/Interservice/Marine Corps Rifle Competition badge in 2175, and in 2177, she became an active member of the USCM At-Risk Youth outreach program. Hey, that's pretty neat - I never knew any of that about Vasquez's backstory before, so let's hear it for NECA putting specific character info on the back of the card and not just the same text all the other figures have shared. 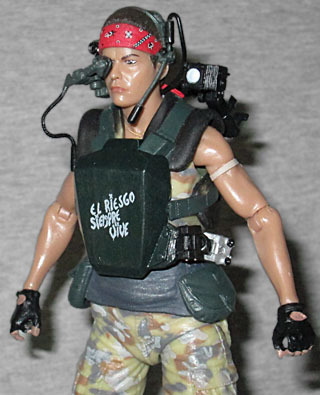 Vasquez was played by Jenette Goldstein, who had to dye her hair and wear contact lenses to look Hispanic. NECA's been trying to negotiate with Goldstein for likeness rights for a few years, and it's finally paid off. Adrienne Smith sculpted the figure, and although NECA has had a lot of really great likenesses over the years, we're just gonna say it: this might be their best one ever. From any angle, in any light, this looks perfectly like Vasquez. Kudos, too, to the factory workers who made the production sample look as good as the prototype - the mold techs who managed to capture every nuanced little wrinkle, and the painters who applied every line perfectly. Clearly Series 9 came out of one of the "good" factories! Many fans have made their own custom female Marines (usually starting with Chell as a base), but this body is an entirely new sculpt. Vasquez is wearing her combat boots, camo pants, and a sleeveless camo shirt (not just her green undershirt). The boots are sculpted with eyelets and laces, and her pants have four pockets: two on the thighs, and two on the seat. She has fingerless gloves and small bands tied above her biceps, but otherwise her arms are bare. 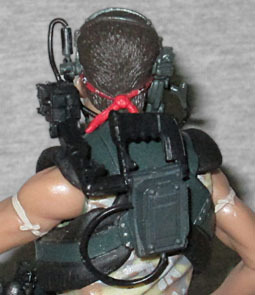 She wears a bandana wrapped around her forehead, in addition to all the other headgear (a microphone on the left and a targeting eyepiece on the right), and her body armor is hidden behind the chest-mounted power pack for her Smartgun. Like the rest of the marines, she was allowed to customize her armor: hers says El Riesgo Siempre Vive ("risk always lives"), a line from her favorite poem (there's more, but it ends up under the armor, so we don't get to see it). Plus, she's got a gold cross necklace sculpted on her neck. So, about that gun. While the M41A pulse rifle was a fairly forgettable weapon, the M56 Smartguns carried by Vasquez and Drake were not. Built from an MG42 machine gun, a Steadicam harness and various motorcycle parts, the Smartgun was originally even longer, but had to be cut down because Goldstein was so short. We got a preview of this weapon on (or more likely, after) "Alien Day," and it's unchanged from that release. Technically Vasquez's gun should have "ADIOS" painted on the side, but that app seems to have been skipped (as was the teardrop prison tattoo under her eye). There are some differences between this gun and the one Ripley carried. For one thing, this one gets a removable muzzle flare, which is just a cool extra. It plugs into the end of the gun, and looks terrific. Also, we actually get the Steadicam arm this time! It plugs into the side of the gun and into the side of her armor, and features a dozen joints of its own - swivels, hinges, a true ball-and-socket balljoint, lots of stuff! In short, it moves just like the real thing would. The the smartgun is so complicated to use, it requires a power source - thus the big battery/targeting computer the user wears on their chest. 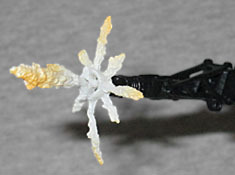 In order to get the power to the gun, there's a cord that runs over the top of the arm and plugs into the gun. Remember the scene where everybody's handing in their ammo, and Vasquez and Drake unplug some dongle to render their weapons inert? 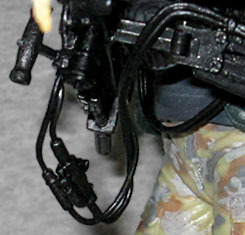 That's sculpted here, dangling on the cord that hangs from the gun. The other end of the cord doesn't seem to go anywhere; in the movie, it's a coaxial cable that plugs into outlets on the chestplate, just like the cord from her headgear does; on the toy, there's nowhere for it to actually plug, so... maybe just tuck the end behind the armor, I guess? 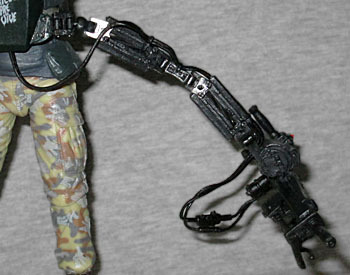 Also, the support arm is misassembled out of the package: according to the movie (and NECA's own promotional photos), the end of the arm that has the battery hanging off it should be nearest to the gun, while the end of the arm that just has the plain cord should be nearest the body; out of the tray, it's the other way around. Luckily, popping the piece out and turning it around to face the proper direction is very easy. 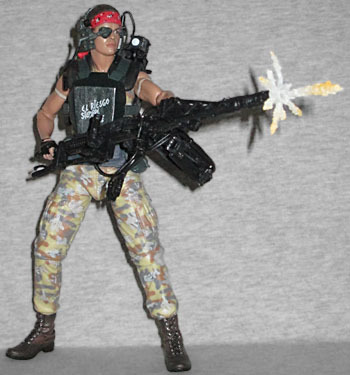 Vasquez herself has the same kind of articulation as the other people (even the artificial ones): a balljointed head, peg-and-hinge shoulders and elbows, balljointed wrists, a balljointed waist, peg-and-hinge hips, peg thighs, peg-and-hinge knees and balljointed ankles. Between the figure and the gun, you can get her into lots of badass gunslinging poses. The gun's targeting eyepiece (which was inspired by similar devices used in Apache helicopters) is on a hinge as well, so you can either put it over her eye, or fold it out of the way so she can see clearly. 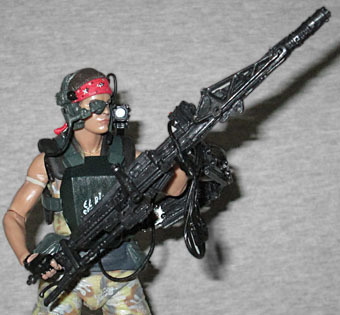 Other than the Smartgun, Vasquez's only accessory is the same TNR Shoulder Lamp we've seen with other marines. Like on those toys, it plugs into her back through a hole in the vest, and also like those toys, getting the holes lined up is really difficult. And you shouldn't even have to, because the flashlight attaches to the M56 combat harness on a plate that extends from the shoulder, rather than directly to the back. But you know, that's just nitpicking. 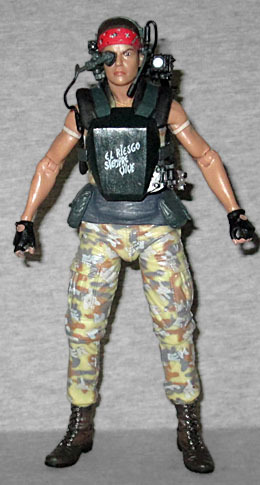 We've got a Vasquez figure! One that looks like her and carries a huge gun! That alone is a big win, and although human figures may sell slower than the Aliens do, we're really glad to get some more firepower on the USCM side.